Colbie Holdnerness, an ex-wife of former White House aide Rob Porter, wrote in a Monday Washington Post piece that she was “dismayed” by Kellyanne Conway’s weekend appearance on CNN. In an interview with Jake Tapper, Conway said that she wasn’t worried about Hope Hicks, the White House communications director who is reportedly dating Porter. “I’ve rarely met somebody so strong with such excellent instincts and loyalty and smarts,” Conway told Tapper. Tapper’s question was prompted by the statements of another of Porter’s ex-wives, Jennifer Willoughby who, last week expressed concern over Hicks’s safety. 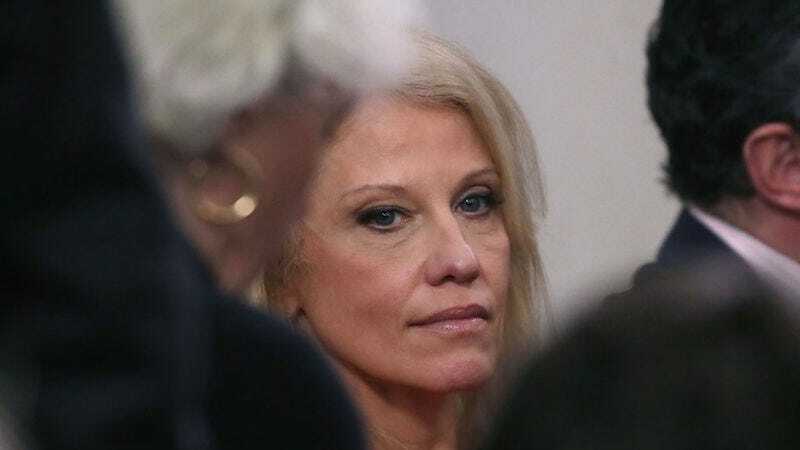 In her op-ed, Holderness wrote that Conway’s “statement implies that those who have been in abusive relationships are not strong.” “I beg to differ,” Holderness continued. Holderness’s op-ed came hours before a Politico report that details the White House’s response to the intimate partner abuse allegations against Porter initially reported by the Daily Mail. Though the White House, and Chief of Staff John Kelly, have publicly condemned domestic violence (as though that were difficult), the Politico report shows a White House desperately scrambling to keep Porter, even after he was accused of physical and emotional abuse and denied security clearance from the FBI. These details yet again contradict the White House’s increasingly hard-to-follow official timeline. Again, on Monday Sanders told reporters that the White House acted within 24 hours of learning the “extent of the situation” to “accept and announce” Porter’s resignation. But it appears that the White House was grasping to contain the story while retaining Porter, regardless of the allegations leveled against him by two ex-wives, as well as an ex-girlfriend who works at the White House. This tracks with previous reports which indicated that Kelly and other White House aides had been made aware of the intimate partner violence allegations months prior to the Daily Mail’s story. Though the White House may say they “support victims of domestic violence,” their actions claim otherwise. Update: According to FBI Director Christopher Wray, the FBI closed Porter’s file in January. Wray said that the FBI submitted a partial report on Porter’s background check to the White House in March and a completed report in July. The FBI shared a follow-up report in November. Wray’s timeline contradicts the White House’s assertation that Porter’s background investigation was “ongoing” when the allegations of intimate partner violence were made public.